A cultivar of Camellia japonica L. A vigorous shrub with oval lance-shaped leaves and large, irregularly double white flowers, strongly marbled red, with some petals red, or white marbled red. [RHSE, Hilliers’]. 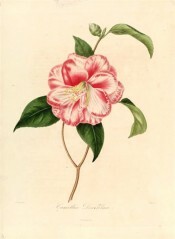 ‘Bud calyx in fine green divisions, papyraceous, reddish at the base, five lines broad and eight long; flower from three to four inches in diameter; petals about 20, an inch broad, and nearly two long, ovate-oblong, obtuse, entire, cherry-red, No.1, variegated and sprinkled with white; the heart of the corolla is composed of from four to six curled petals, between them are perceived several fertile stamens, with others in a petaloid state.-Magnificent.’ [Berlèse Monography p.92/1838]. ‘Donckelaeri’ was brought to Belgium from Japan by Franz von Siebold in 1830, together with ‘Tricolor’, ‘Ochroleuca’ and ‘Candidissima’, all of them raised and propagated by Donckelaer. [ICR]. Berlèse Iconographie vol.1 pl.9/1841-43. Listed in the 1845, 1850 and 1857 catalogues. [T.219/1845] ‘Donckelaeri’ is marked with a ‘c’, denoting grown at Camden, in an 1836 edition of Loddiges’ Nursery catalogue held at Camden Park [CPA]. Probably obtained from Loddiges’ Nursery, either in a case of plants brought back by Bidwill or in a direct importation in late 1844. Concerning the latter Macarthur wrote on 6th January 1845 that he now had five camellias ‘which we had not before’, and of the former that he had saved 60% of the plants: ‘You will judge therefore how much I am in your debt’. [MP A2933-2, p.28].